Tuesday July 17th marked the first race of WUOC - the always-exciting Sprint Relay! This race took place along the river in Seinäjoki, a lovely area with small islands and pine trees galore, sprinkled with some residential housing areas and gardens. The weather was pretty hot and very un-Finland like, around 28C and sunny. Shade was scarce, but we all managed to beat the heat. 3-2-1 - the race was off and I found myself near the front, leading the group to my 1st control which was the longer forking. The first leg was long and simple, so it was easy to read ahead quite a bit for the rest of the course, where I settled in to about 9-10th position. The course itself didn't really have much route choice, and wasn't anything special, but the last few controls were fun in the area with many small islands. The loop after the spectator control. How would you go from 15-16? I managed to make up some time in this last loop and handed over to Adam in 5th place! 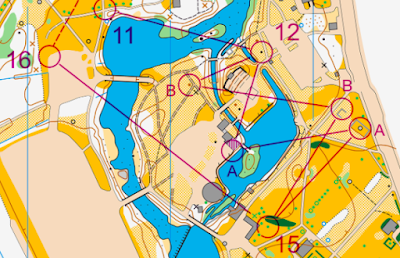 The mens courses were around 4.3km with a winning time of 14mins and 20s. Despite having some issues with his EmitTag like a bunch of other runners, Adam ran a solid course and passed over to Michael in 16th place. Michael also blazed through the course and handed off to Pia in 17th position. Pia ran the last leg for our team and battled it out with the Italian runner for the last loop, placing us in 18th position! It was a lot of fun racing on this team, and we are all happy with our result. After a refreshing swim in the lake after the race, we are ready for the rest of the week! Thanks Emma! Nice run on your first leg and way to go Adam, Michael and Pia!